The Blurb: Why use the traditional approach to study the stars when you can turn computers, handheld devices, and telescopes into out-of-this-world stargazing tools? Whether you’re a first timer or an advanced hobbyist, you’ll find Astronomy Hacks both useful and fun. From upgrading your optical finder to photographing stars, this book is the perfect cosmic companion. This handy field guide covers the basics of observing, and what you need to know about tweaking, tuning, adjusting, and tricking out a ‘scope. Expect priceless tips and tools for using a Dobsonian Telescope, the large-aperture telescope you can inexpensively build in your garage. Get advice on protocols involved with using electronics including in dark places without ruining the party. Astronomy Hacks begins the space exploration by getting you set up with the right equipment for observing and admiring the stars in an urban setting. Along for the trip are first rate tips for making most of observations. 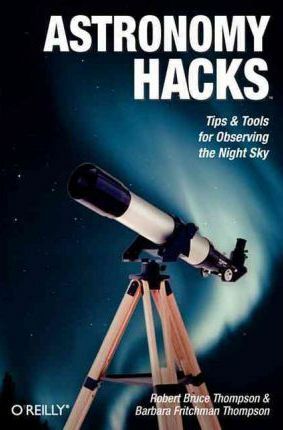 The hacks show you how to: * Dark-Adapt Your Notebook Computer * Choose the Best Binocular * Clean Your Eyepieces and Lenses Safely * Upgrade Your Optical Finder * Photograph the Stars with Basic Equipment The O’Reilly Hacks series has reclaimed the term “hacking” to mean innovating, unearthing, and creating shortcuts, gizmos, and gears. With these hacks, you don’t dream it-you do it–and Astronomy Hacks brings space dreams to life. The book is essential for anyone who wants to get the most out of an evening under the stars and have memorable celestial adventures.